FIFA World cup – live stream, odds, results, stats and fixtures! The 2018 FIFA World Cup will be the 21st World Cup to be held, and it will take place in Russia. One month of football awaits, since the championship will start on June 14th and go on until July 15th. We will be following the entire championship – and will of course provide you with the latest odds, news, schedules, tables and results! That way, you can make the most out of your World Cup betting. The 2018 FIFA World Cup in Russia will be the first World Cup held in Europe since the 2006 championship in Germany. The tournament will involve a total of 32 teams, where all except from Russia have been decided through qualifying competitions. Russia’s national team is automatically qualified since they are the host team. The 32 teams includes defending champions Germany, as well as Iceland and Panama that will be making their first-ever appearances in the FIFA World Cup. The tournament will be held in 12 different football arenas, 11 of which are located west of the Ural Mountains in order to make travel time manageable for the participating teams. Here at Odds Expert we provide you with the best odds on all major events. The World Cup is of course no exception. On this page you’ll find odds for all the scheduled matches. If you head over to our Odds Comparison you can also find the very best odds offered on every single match. World Cup odds can be found on most online betting sites, but here at Odds Expert we collect all the available World Cup odds in one place. The advantage this gives you is that you can get an easy overview over the available World Cup odds. That will of course make finding the best odds simple. You can also use our tool Bet Mate in order to create a bet slip with the bets you’re interested in placing. That’s what we call World Cup betting made easy! At our offers-page you will also find the latest World Cup betting offers available, with boosted odds and other campaigns from the best online bookmakers! We want to make sure that you have the best chance possible to place qualified bets. That’s why we have collected everything you need to know about the FIFA World Cup 2018 in Russia in one place! You’ll find stats from the different matches, the complete tournament schedule as well as betting promotions and results! You’ll find results from all previous matches on our results-page – so you can follow your favorite team through the tournament. Looking at the World Cup results from previous matches for the teams is also a great way to place qualified bets on upcoming matches! The hosting team is always directly qualified to the tournament, so for the 2018 FIFA World Cup, Russia didn’t have to enter the qualifiers for the tournament. Since the 1998 tournament, the World Cup has consisted of 32 teams. The number of participating teams will change to 48 in the 2026 World Cup tournament. 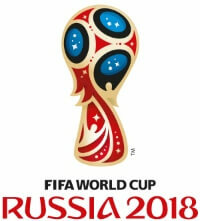 But for the 2018 FIFA World Cup Russia – there will be 32 participating teams just as it’s been for the last five tournaments. England qualified to the World Cup 2018 as group winners of Group F in the European qualifiers. A total of 20 World Cup tournaments have been played so far, and they’ve had eight different winners. Brazil has been the mot successful team, winning the World Cup a total of five times. They are also the only team that has played in every tournament. Germany and Italy has won four titles each, Argentina and Uruguay has won two times each. There’s also three teams with one title each – England, France and Spain. Germany are the defending champions from the 2014 FIFA World Cup, after defeating Argentina in the final. The final was very even, and wasn’t settled until the 113th minute. That was when Götze scored the only goal of the match.